A new mouse mutation, Sprawling, highlights an essential role for the dynein heavy chain in sensory neuron function, but it lacks the ability of other known heavy-chain mutations to ameliorate neurodegeneration due to defective superoxide dismutase. Eukaryotic cells transport molecules, complexes and organelles around the cell by means of energy-dependent motor proteins. The main motor responsible for movement of cargos to the minus end of microtubules is cytoplasmic dynein. This is a huge multisubunit protein complex that interacts with many intracellular pathways and whose multifarious roles in the cell are far from being completely understood. In neurons, dynein is the major retrograde motor, moving cargoes from the synapse along the axon and back to the cell body. 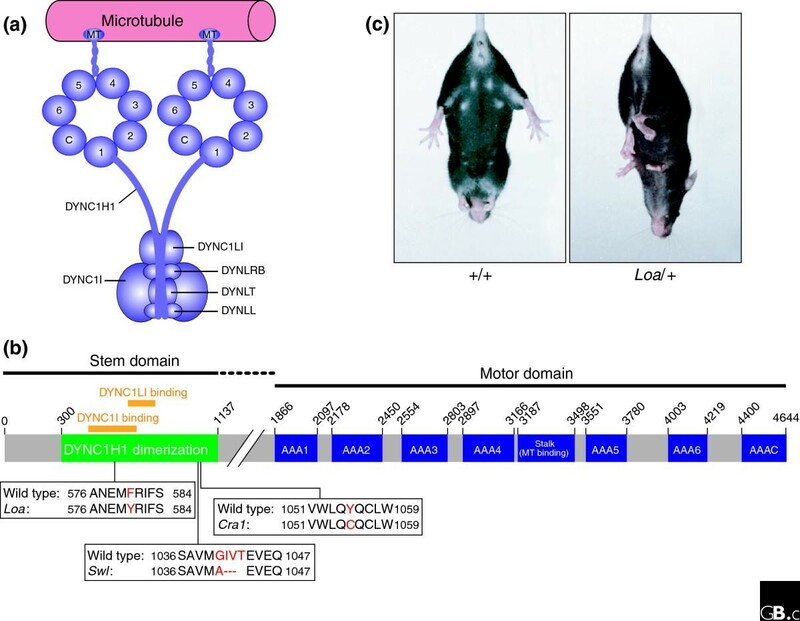 Previous mutations in the core of this motor - the dynein heavy chain - are known to ameliorate neurodegeneration in mouse models of amyotrophic lateral sclerosis (ALS). A recent paper by Chen, Popko and colleagues  reporting a new mouse mutant for the dynein heavy chain extends our knowledge of the effects of dynein mutations on the nervous system, but the mystery of dynein's relation to neurodegenerative disease thickens. Cytoplasmic dynein is a large complex of proteins whose constituent members are the heavy chain (encoded by a single gene), the intermediate chains (two genes), the light-intermediate chains (two genes), and the light chains (three genes) . The precise stoichiometry of the intact complex is not known, but at its core lies a homodimer of heavy chains. This dimer binds to microtubules and enables dynein to move in an ATP-dependent manner . The other dynein subunits are thought to maintain the stability of the complex, to modulate its activity and to interact with accessory and cargo proteins (Figure 1a) [4–10]. Cytoplasmic dynein may also perform tasks other than transporting cargos; for example, endosomes depend on dynein not just for their motility, but also for their maturation, morphology and receptor sorting . Heavy-chain dynein mutations. (a) A schematic diagram of the cytoplasmic dynein complex. The core of the complex comprises a homodimer of heavy-chain subunits (DYNC1H1), the carboxy-terminal half of which form seven AAA-ATPase domains (labelled 1 to 6 and C). The dynein intermediate (DYNC1I) and light-intermediate (DYNC1LI) chains bind to the amino-terminal domain of the heavy chains. The light chains (DYNLRB, DYNLT and DYNLL) all bind to the intermediate chains. The dynactin complex (not shown) binds to the cytoplasmic dynein intermediate chains. Adapted from . (b) Protein domain map of the cytoplasmic dynein heavy chain, showing the location of the mutations Loa, Cra1 and Swl. The motor domain consists of the six known AAA-ATPase domains (AAA 1 to 6) and an unrelated seventh domain (AAAC). The microtubule-binding domain lies between AAA4 and AAA5. The amino-terminal half of the protein contains the intermediate (DYNC1I), light-intermediate (DYNC1LI) and heavy (DYNC1H1) chain binding domains [21,22]. The Loa mutation falls within both the DYNC1H1 dimerization and DYNC1I binding domains. The Cra1 and Swl mutations fall outside of the DYNC1I binding domain, but still within the DYNC1H1 dimerization domain. (c) The hind-limb clasping phenotype of Loa/+ mice. When held by the tail, wild-type (+/+) mice splay their hind legs away from their body. In contrast, Loa/+ mice withdraw their hind limbs, pulling them into their body. Swl/+ mice display a similar phenotype. The cytoplasmic dynein heavy-chain protein has a mass of 532 kDa and is encoded by a 78-exon gene, DYNC1H1; no splice isoforms are known (Figure 1b). A Dync1h1 mouse knockout results in no detectable phenotype in heterozygotes and early embryonic lethality in null animals . Two mouse mutants - Legs at odd angles (Loa) and Cramping 1 (Cra1) - have been described previously, both of which are due to point mutations in Dync1h1 (Figure 1b) . These single amino-acid substitutions result in similar phenotypes: heterozygous animals show clenching of the hindlimbs when held by the tail (Figure 1c) and an obvious gait disorder, and homozygotes die at or before birth. Histological studies of the spinal cord of heterozygotes reveal a progressive loss of motor neurons. Retrograde axonal transport as measured by the movements of a fluorescent tetanus toxin fragment is normal in heterozygous Loa embryonic motor neurons but is slowed down in homozygotes [13, 14]. The new mutation described by Chen et al. is a radiation-induced dominant mutation that arises from a 9-bp deletion in Dync1h1 that changes the four residues from position 1,040-1,043 into a single alanine, and it lies close to the Cra1 mutation (see Figure 1b). Called Sprawling (Swl), the phenotype of Swl heterozygotes (Swl/+) is strikingly similar to the limb clenching of Loa and Cra1 heterozygotes. Swl/+ mice also develop gait abnormalities and have reduced hindlimb grip strength. But although the outward phenotype of Swl heterozygotes is so similar to those of Loa and Cra1 heterozygotes, Chen and colleagues  found no reduction in the number of motor neurons in the spinal cord of Swl/+ mice (Table 1). Instead they uncovered clear signs of moderate sensory neuropathy. Thus, this paper highlights for the first time the essential role of the dynein heavy chain in the functioning of mammalian sensory neurons. *Tendency to longer time in tail-flick test, but never shown to be statistically significant (Rogers D, EMCF, Martin JE, unpublished data). †Not statistically significant. ‡(Bros V, EMCF and Greensmith L, unpublished data). On further examination, the authors also found a similar sensory deficit in Loa/+ mice, and went on to show that while nociception (the sensing of pain) was unaffected, proprioception (the reception of stimuli produced within the body) was markedly affected in both Swl/+ and Loa/+ strains, with a striking decrease in the number of proprioceptive sensory receptors. They also found that neuron loss in the dorsal root ganglia was greater in lumbar spinal cord than in the cervical region and that this loss was considerably greater for proprioceptive than for nociceptive sensory neurons. Furthermore, there was degeneration of muscle spindles during late embryonic development that was concomitant with the loss of lumbar proprioceptive neurons in Loa/+ and Swl/+ mice, and the dorsal roots of the lumbar segments were also thinner than the ventral roots. Chen et al. conclude that the early-onset proprioceptive sensory defect is common to Swl/+ and Loa/+, and that this defect, rather than the motor neuron loss, is likely to account for the movement disorder observed in both mice. The new Swl mutation may also help us to a better understanding of the possible involvement of dynein in neurodegenerative disease. The devastating human neurodegenerative disorder amyotrophic lateral sclerosis (ALS) involves progressive loss of motor neurons, resulting in complete paralysis and death, usually 3-5 years after diagnosis. The disease strikes people in mid-life and is inexorable and incurable. Mental faculties are usually spared while the body becomes progressively immobilized. ALS clearly has a genetic component, but as yet only one major-effect gene is known, superoxide dismutase 1 (SOD1), which encodes an enzyme that removes free radicals (reviewed in ). ALS-associated mutations in SOD1 are almost all autosomal dominant with high penetrance; the enzymatic activity of the protein generally remains intact and the mutant protein takes on a dominant gain-of-function, which for unknown reasons kills motor neurons. In working with the mouse as a model system, we have the ability to set up crosses and see what happens. Chen et al. made crosses between their Swl heterozygotes and a SOD1G93Atransgenic strain that models human ALS , and between Loa heterozytoes and the SOD1G93Astrain. They report that the survival time of the Loa, SOD1G93Adouble heterozygotes is increased, as found in our previous work on this cross , but that the Swl, SOD1G93Adouble heterozygotes had no difference in survival time compared to their SOD1G93Alittermates . The difference between the effects of the Loa and the Swl mutations when combined with the SOD1G93Atransgene is intriguing, and, as Loa also causes loss of motor neurons as well as a sensory neuron defect, one interpretation of these findings is that the different dynein heavy-chain mutations are differentially affecting pathways in different types of neurons. The ability of the Loa and Cra1 mutations to attenuate the SOD1G93Aphenotype and extend lifespan [14, 16] is still much of a mystery. In the case of Loa, the double heterozygotes lived for around 28% longer than their SOD1G93Aparents and siblings, and, bizarrely, the rate and flux of retrograde axonal transport were actually increased compared with their siblings. Research investigating interactions between cytoplasmic dynein and mutant SOD1 includes reports of co-localization of dynein components and mutant SOD1 in ALS mouse models , the interaction of mutant SOD1 proteins with cytoplasmic dynein  and perturbation of transport of mitochondria in motor neurons from SOD1G93Amice . Given that Swl has no detected motor neuron involvement and does not attenuate the effects of the mutant SOD1 protein, one exciting possibility arising from the new work  is that further insight into the different effects of the various dynein heavy-chain mutations may well help our understanding of SOD1-related ALS in humans (Table 1). There is at present no obvious explanation from the sites of the Loa, Cra1 and Swl mutations in the dynein gene to why two out of three of them affect the SOD1G93A phenotype, and the differences between these mice and the molecular mechanisms of each mutation clearly warrant closer examination. One intriguing question is whether effects on axonal transport in motor neurons is responsible for this differential effect on the SOD1 mutant phenotype, and a dissection of axonal transport in live Loa/+ mice would be of great interest in this context. Chen and colleagues  suggest that altered Trk signaling may lead to cell death in Loa/+ and Swl/+ mice, raising the question of how cell signaling pathways are altered in these mice in sensory and motor neurons. A further question is whether the Swl, Loa and Cra1 phenotypes arise from dysfunction of the complete cytoplasmic dynein complex, or from an as yet unknown function of only the heavy chain. It is likely that this huge protein has more functions that we yet know of. Finally, Chen et al. have clearly shown that the ubiquitously expressed cytoplasmic dynein heavy chain is essential for the development and function of a subset of neurons in the sensory nervous system. Why this should be remains a mystery. For all those interested in dyneins, axonal retrograde transport, the nervous system and neurodegeneration, there is an exciting road ahead. We thank the Wellcome Trust for support. We are most grateful to Giampietro Schiavo, Brian Popko, Linda Greensmith and Majid Hafezparast for critical comments and helpful insights on the manuscript and Ray Young for graphics.